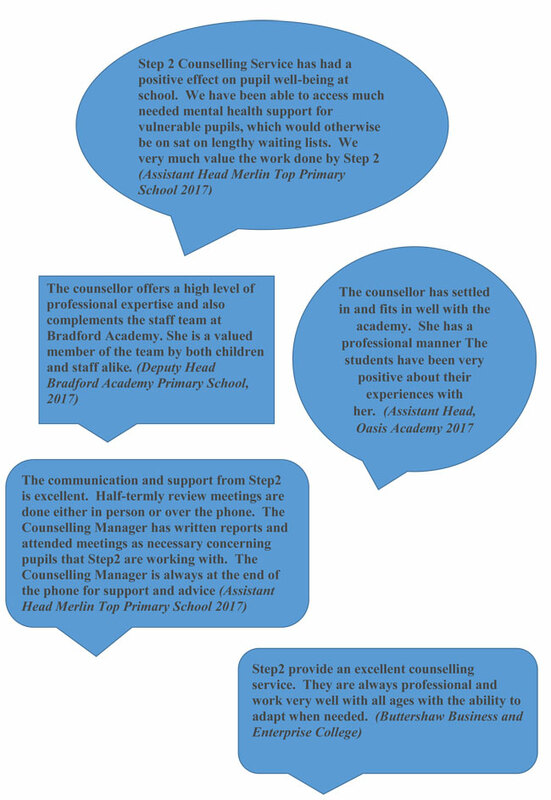 Step 2 offers a counselling service in primary and secondary schools in response to current government guidelines in addressing mental health issues for children and young people in education. 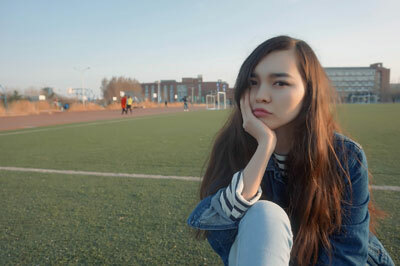 With the seemingly ever increasing challenges placed on young people, pastoral staff and other support staff often do not have the time or necessarily the skills to deal with more complex emotional disturbance manifesting itself in some young people. Yet if these issues are not addressed properly, the impact on attendance and achievement can be significant. We have been working successfully in primary and secondary schools in Bradford over the last few years. All our counsellors are fully qualified and experienced in working therapeutically with children and young people. They are all registered members of the British Association of Counselling and Psychotherapy (BACP) and are therefore work within the BACP Code of Ethics. In order to quality assure their work and ensure client safety, they are required to have their own personal monthly supervision in place and attend group supervision and regular 1:1 support at Step2. When schools are able to offer young people a confidential space to explore difficult feelings or experiences they may be having, those young people can begin to work to resolve such issues and reduce the impact they may be having on their learning. 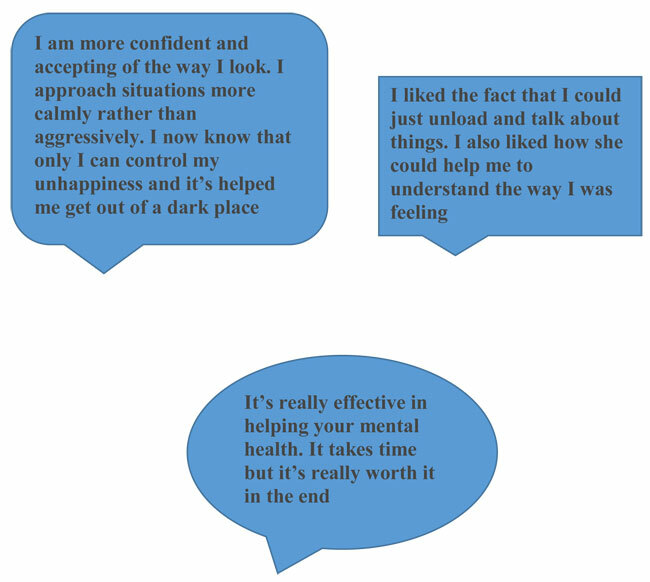 Primarily this will be individual work but for some young people group work can be beneficial, especially those struggling with issues around confidence and low self-esteem. The support we deliver contributes to the Government’s Future in Mind strategy. By providing emotional support to children and young people we can help create the best conditions for them to realise their potential. Learning to build resilience and express feelings responsibly. Partnership working is a vital part in effecting successful outcomes of counselling with young people. Working closely with pastoral staff within the school; developing relationships with and signposting to other key agencies and, where appropriate, working with parents, carers or families are all important elements of this work. Step2 follows school child protection procedures, and works closely with the leadership team to ensure that safeguarding issues are responded to quickly and appropriately. To find out more about our service in schools and how to access it, please refer to the Support in Schools section.